Fits most steering wheels with rim dia. 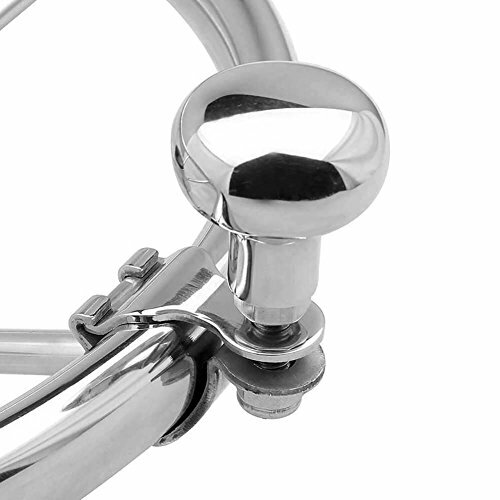 from 5/8" to 1"
The mounting clamp is designed for an oval ring bar. if your wheel is round stock, you could reshaped the lower piece slightly with two pairs of pliers. May fit perfectly and works great. within 24 hours and help you to resolve the problems ASAP. 3 spoke steering wheel. 13-1/2 diameter, 3-1/2 height. Fits all standard 3/4 tapered shaft helms. Steering wheel INCLUDES a 5/8 -18 retaining nut . 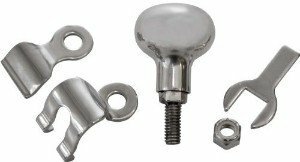 Steering wheel INCLUDES a 1/2-20 retaining nut for Teleflex manual cable steering helms, may fit others. 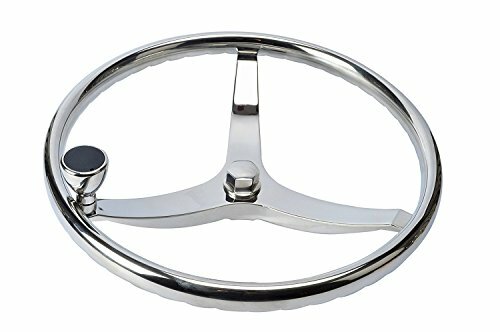 M-ARINE BABY Sports Steering Wheel 15-1/2" with KNOB, Pressed Finger Grip for Better Control & Eye CATCHING Style, Fits 3/4" Shaft Rim Size 1"
M-ARINE BABY SPORTS STEERING WHEEL 15-1/2" with KNOB, PRESSED FINGER GRIP for BETTER CONTROL & EYE CATCHING STYLE. Fits 3/4" Shaft RIM Size 1"
Medium Cone shape Wheel Turning Knob. Includes a locking nut and Plastic cover. 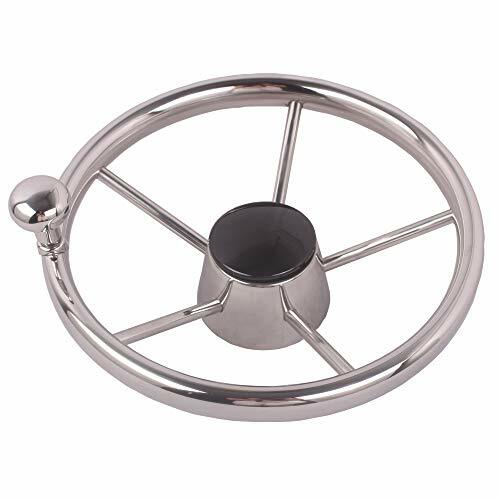 Installation and Usage: WARNING : This Spinning turning knob is designed for Boat Destroyer Steering wheel, for an 3/4 x 1 oval wheel. If your wheel is round wheel, you will need to reshaped the clamp mount pieces slightly with two pairs of pliers. May fit perfectly and works great. But we will not accept Altered items return back to stock. Please be sure your purchase. 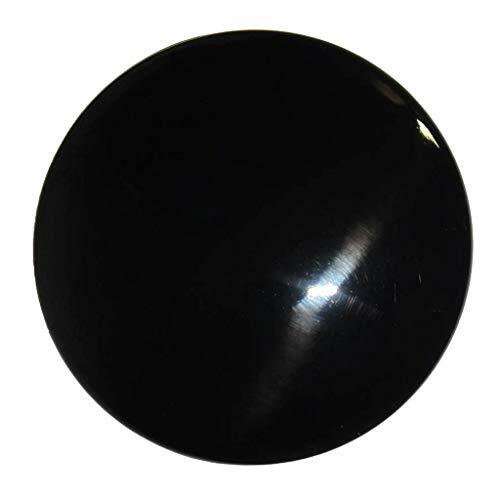 Design and fit for Boat Destroyer Steering Wheel knob,for 3/4 x 1 oval wheel, can be slightly altered by desire. Cone Shape provide comfort grip while maneuver. Bearing spinning knob allows to maneuver the steering wheel quickly. Fits most steering wheels with rim dia. from 5/8" to 1". Fits most steering wheels with rim dia. from 5/8 to 1. 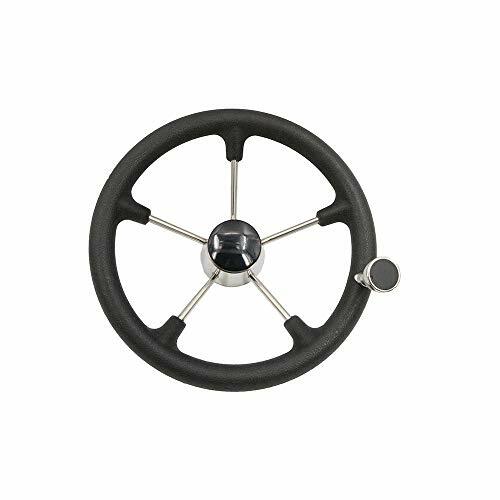 Item Description: This Pactrade Marine destroyer steering wheel is highly durable to resist the harsh marine environment and corrosion resisted. It is constructed of high quality stainless steel 304, and polished to a bright mirror finish. 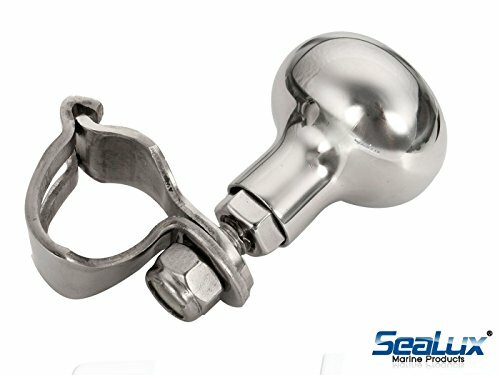 Stainless steel gives a smooth and shiny feel, and gives a classic and durable addition to your boat. It has five spoke, and fits standard 3/4" tapered shafts. 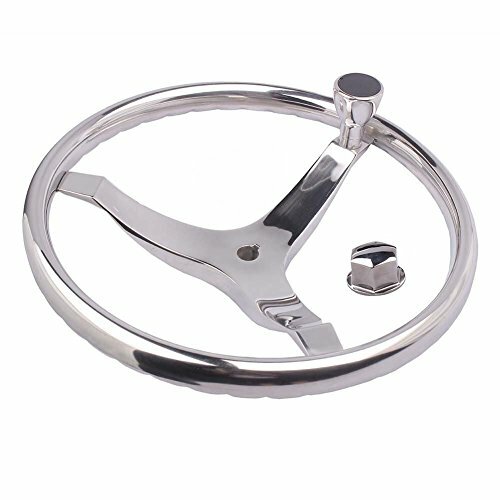 This steering wheel features a 13 1/2" diameter, and the distance between each spoke is about 7". 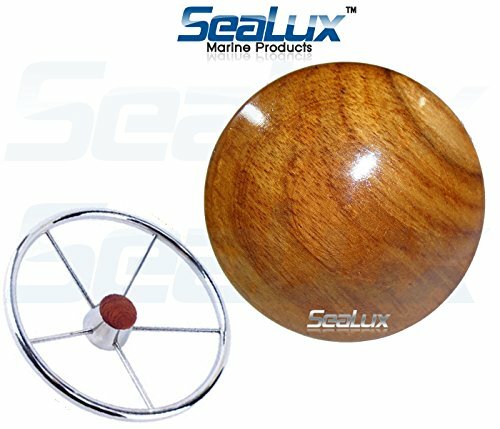 It comes with teak wood steering wheel center cap. Please note every computer shows colors differently. All measurements are approximate. Specification: Wheel diameter: 13 1/2". Tube diameter: 7/8". Center cap diameter: 2 3/4". Depth: 3 1/2". 5 spoke. 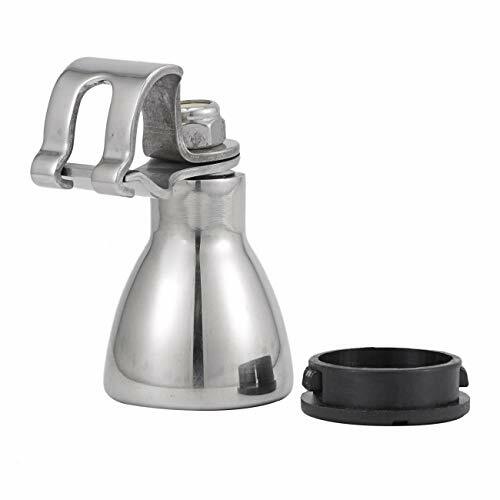 Made of high quality stainless steel 304. Fits to 3/4" tapered shafts. Item number: P73061. 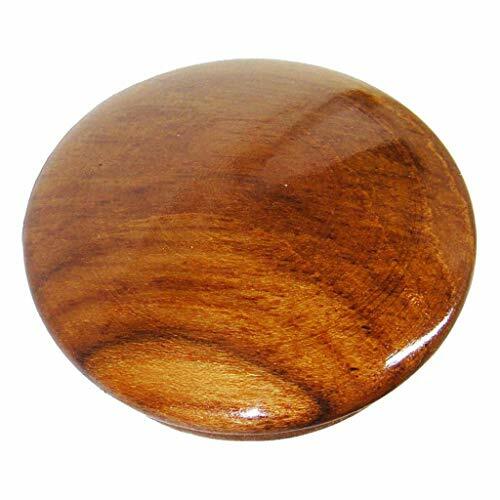 Package Includes: Teak wood center cap. This Pactrade Marine destroyer steering wheel is highly durable to resist the harsh marine environment and corrosion resisted. It is constructed of high quality stainless steel 304, and polished to a bright mirror finish. 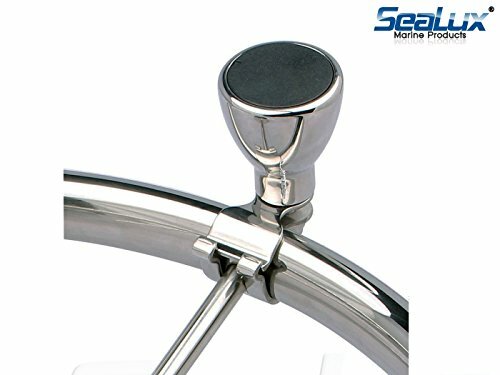 Stainless steel gives a smooth and shiny feel, and gives a classic and durable addition to your boat. It has five spoke, and fits standard 3/4 tapered shafts. This steering wheel features a 13 1/2 diameter, and the distance between each spoke is about 7. It comes with teak wood steering wheel center cap. 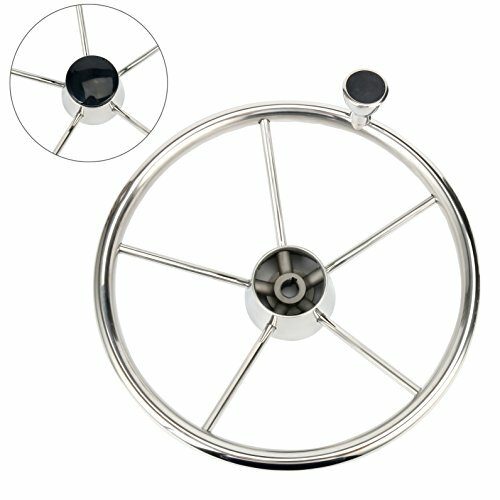 13-1/2 Inch 5 Spoke Steering Wheel with Black PU Foam and Knob for Marine Boat. Made of strong Stainless Steel and Black PU foam wheel protection. 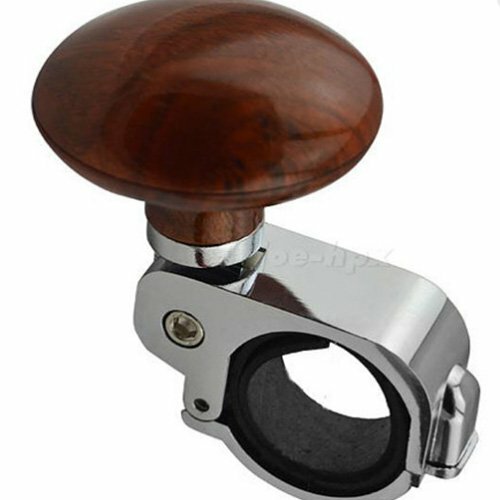 With elegant knob for easy turning and wheel use. 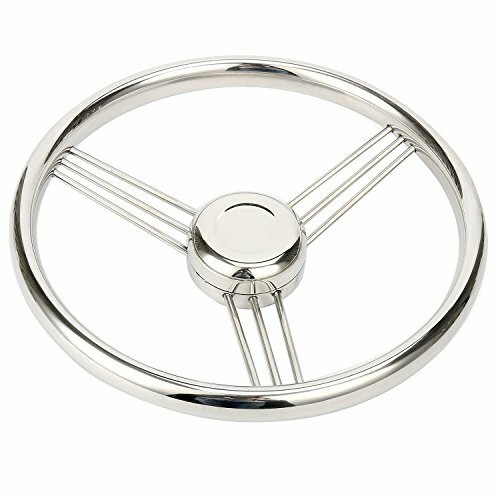 Perfect for a new boat or yacht or a new change of steering wheel. Size: 13.5'' Spoke:5 Shaft: 3/4 Dish: 25 degree. 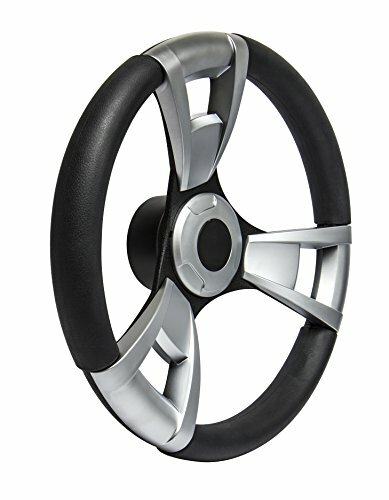 Material: Boat steering wheel is made of Stainless Steel and Black PU foam wheel protection. Size: 13-1/2 diameter, Dish: 25 degree. Fits all standard 3/4 tapered shaft. 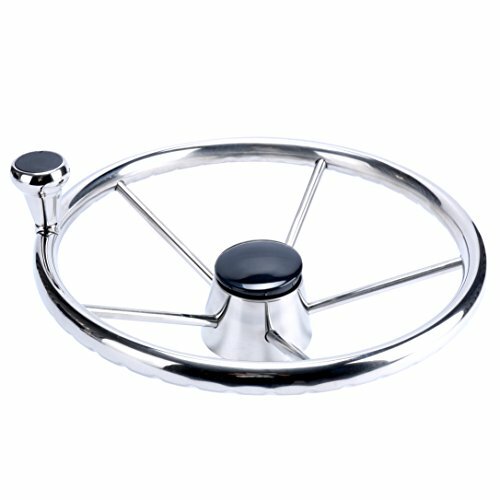 5 spoke boat steering wheel with elegant knob. 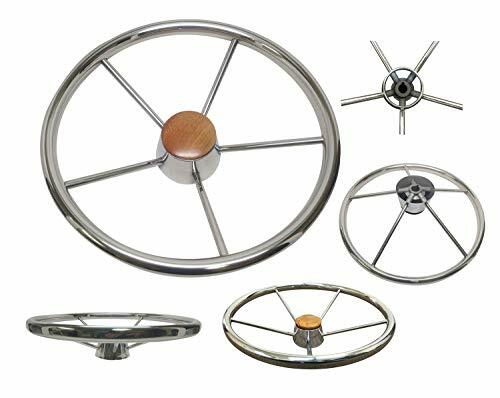 When properly installed, these steering wheels will attach to marine helms with ABYC standard 3/4" round tapered steering shafts, using SeaStar solutions or equivalent anti-vibratory lock nuts. 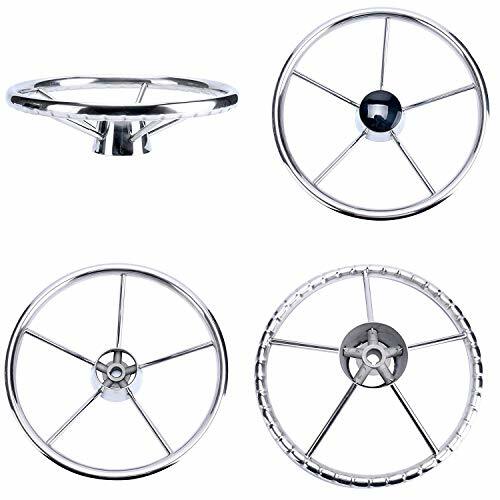 Wheels with equidistant spokes are suggested for boats equipped with Hydraulic steering in which a centered or "master spoke" wheel cannot be maintained. --1.100% Brand new and high quality. --6.If the diameter of the steering wheel is narrow adjust by using the rubber backing and attach the product. --7.For vehicles with attached steering wheel covers,scparate the cover,reassemble,and then attach the steering cover again. --8.Clip the ring on the steering wheel at a proper position. Screw the bolt up to fix the ring securely. 2. 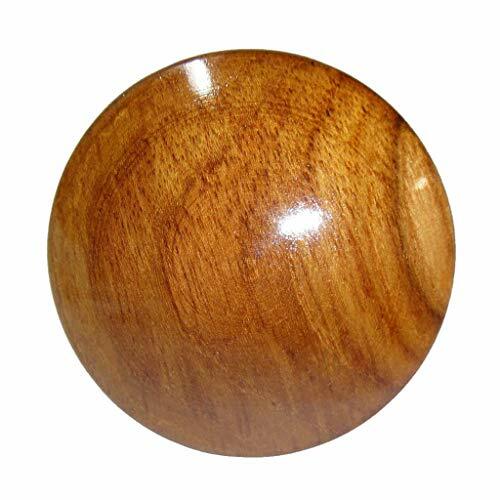 Impact resistant knob is designed to fit in the palm of your hand in a round shape. 3. Heavy-gauge clamp with rubber insert for fixing to the steering wheel more tight.Easy to drive, long-distance driving, the steering wheel is no longer heavy, more relaxed for driving. 4. The enclosed rubber belt also can be used to adjust the fixing ring's size. 5. 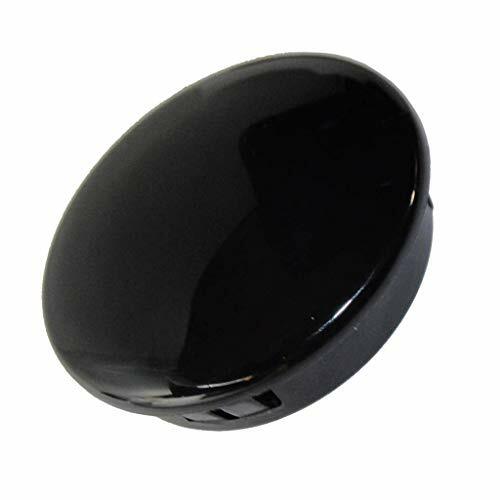 Easy installation, suitable for most steering wheels of cars, trucks or boats. Suitable for the steering wheel diameter below 32 mm. - Face diameter: 2-5/8" ; Insert diameter: 2-1/2" ; Insert depth: 3/8"
- Classy upgrade to your faded crappy plastic cap. Classy upgrade to your faded crappy plastic cap. Specification: Materal: Stainless-steel & Plastic Size: 1-7/8" x 1-5/8"(H*D) Description: Construction of cast investment Stainless Steel. Grip knob diameter: 1-5/8" (Medium), Grip Height: 1-7/8". 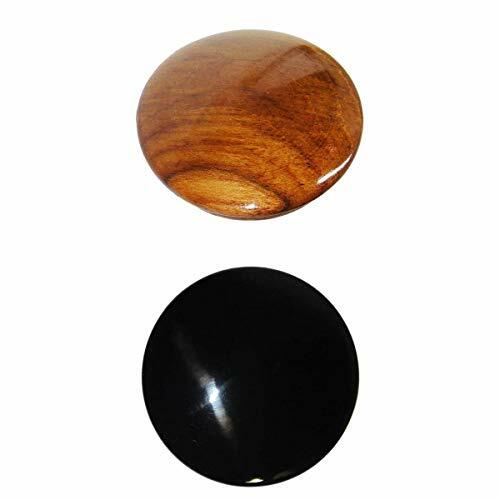 Design and fit for Boat Destroyer Steering Wheel knob,for 3/4" x 1" oval wheel, can be slightly altered by desire. Cone Shape provide comfort grip while maneuver. Bearing spinning knob allows to maneuver the steering wheel quickly. Construction of cast investment Stainless Steel. 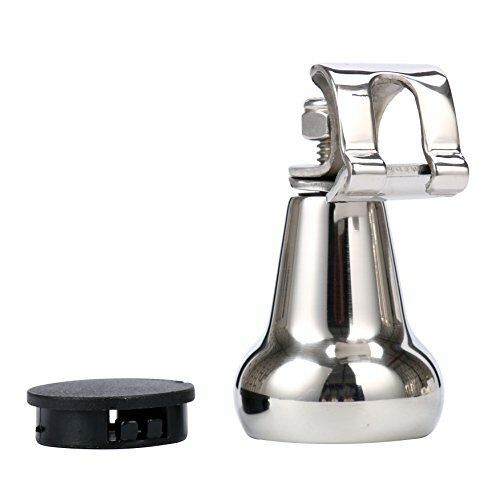 Grip knob diameter: 1-5/8 (Medium), Grip Height: 1-7/8. - PC construction , High strength, fatigue resistance, dimensional stability.Not easy to deform, easy to install. - Gloss finish.Upgrade the appearance of your steering wheel. PC construction , High strength, fatigue resistance, dimensional stability.Not easy to deform, easy to install. Gloss finish.Upgrade the appearance of your steering wheel. - Perfect for use with boat steering wheels. 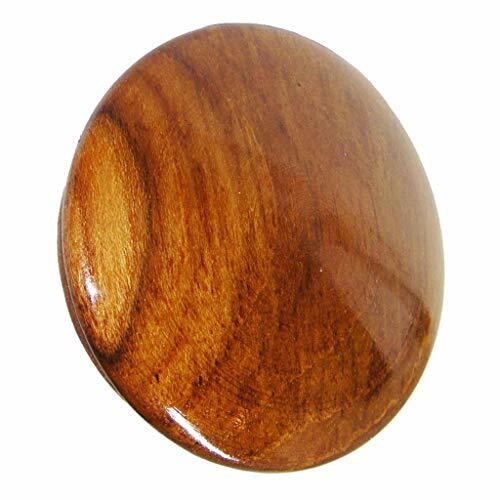 1 Piece Wooden Steering Wheel Center Cap. 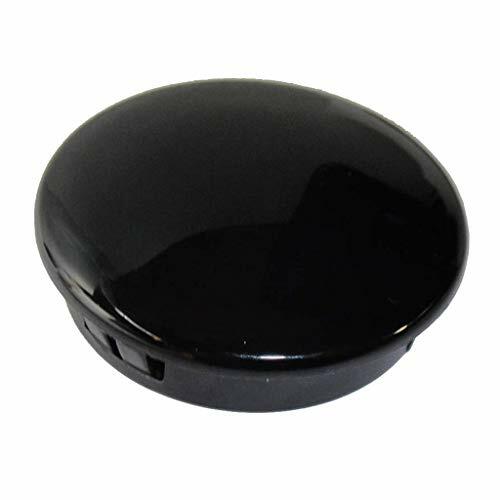 1 Piece PC Polycarbonate Steering Wheel Center Cap. Perfect for use with boat steering wheels.